Footnoting Policy of Watchtower, and actual footnotes to their booklet, "Should you believe in the Trinity"
Footnoting Policy of Watchtower, and actual footnotes to their booklet, "Should you believe in the Trinity". Why the Watchtower was reluctant to include footnotes in booklet? The Watchtower implied in a bold taunt to Trinitarians, on the back cover of October 1, 1990 Watchtower magazine, that the "Should you believe the Trinity" magazine was a scholarly collection of resourceful "evidences" against Trinity doctrine. We draw your attention to the fact that the Watchtower booklet, "Should you believe the Trinity?" has NO FORMAL FOOTNOTES. The best they provide are vague partial references to a book Title (often not even quoting the entire title) or an author (often mentioning only a last name) and RARELY giving the article in the encyclopedia, (so the reader has to guess which one of 1 million articles in a 25 volume encyclopedia the quote came from) and NEVER gives a page number, leaving the reader helpless within a book, unless he reads the whole book! Further, they quote several times from non-English resources that are not translated into English. The Watchtower was kind enough to translate their little deceptive quote, but such quotes in an English resource makes it difficult to even check it they quoted it right! Of course "making it difficult to check on them" is exactly why the Watchtower designed the format of the book in the first place. They cannot argue that it would take too much space up to insert the footnotes, because the booklet is already 32 pages long. Further, if they used the same tiny print that they already used on the back cover (to tell you how to contact the "Faithful and discreet servant"), they could fit all the quotes on one page. In fact, by reducing two of the many large graphics in the booklet, they could easily free up enough room to add all the footnotes and keep the booklet 32 pages long. They deliberately chose not to include the footnotes! Any Jehovah's Witness who reads the original sources they quote, will always come away knowing that their "God directed" organization is dishonest! The Watchtower boasts in the front cover of this booklet of a first printing of 5 million. This means that it is the single most important anti-trinitarian document that the JW's use in their efforts to teach the public door to door that Trinity is of pagan origin. But it is all deception and lies! Of course, when they use this magazine in third world countries, the deception is complete, for most of the books are not even within the national borders of these poor countries, making doubly impossible to check! Section 1: Should You Believe It? 1. "The Paganism in Our Christianity," by Arthur Weigall, 1928, (G. P. Putnam's Sons, NY, London) p. 197; "A Dictionary of Religious Knowledge", edited by Lyman Abbott, 1875, (Harper & Brothers, Publishers, NY) p. 944. 2. "Catholicism," edited by George Brantl, 1962, (George Braziller NY) p. 78. 3." Ibid"., p. 69; "Trinitas: A Theological Encyclopedia of the Holy Trinity,. by Michael O'Carroll, 1987, (Michael Glazier, Inc., Wilmington, Delaware) pp. 29, 30. 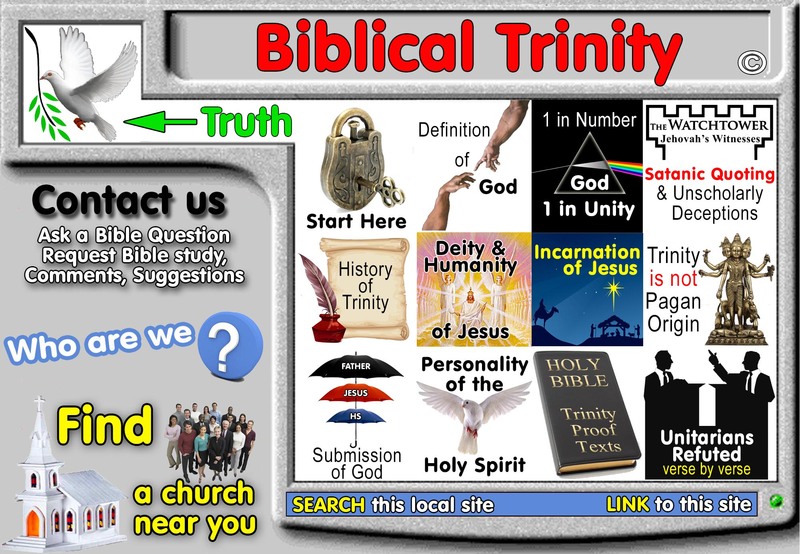 Section 2: How Is the Trinity Explained? 4. "The Catholic Encyclopedia", 1912, Vol. XV, (The Encyclopedia Press, Inc., NY) p. 47. 5. Heraklion, Crete, Greece, court decision 87/1986, April 7, 1986, pp. 17, 19. 6. "Our Orthodox Christian Faith", by Athanasios S. Frangopoulos, (The Brotherhood of Theologians, Athens, Greece) Third Edition, Chapter IV, 1985, p. 71. 7. "New Catholic Encyclopedia", 1967, Vol. XIV, (The Catholic University of America, Washington, D.C.) p. 304. 8. "The Encyclopedia Americana", 1977, Vol. 27, (Americana Corporation, NY, NY) p. 116. 9. "GRIT," (newspaper; Williamsport, PA) October 30, 1983, p. 12. 10." The New Yorker", (magazine; New York, NY) March 23, 1987, p. 64. 11. "L'Osservatore Romano", (newspaper; Vatican City) August 10, 1987, p. 4. 12. "A Dictionary of Religious Knowledge", p. 944. 13. "New Catholic Encyclopedia", 1967, Vol. XIV, p. 304. 14. "What Are They Saying About the Trinity?" by Joseph A. Bracken, 1979, (Paulist Press, NY) pp 1, 3. 15." Christianity and the World Religions." by Hans Kung, 1986, (Doubleday & Co., Inc., Garden City, NY) p. 113. 16. "The Catholic Encyclopedia," 1912, Vol. XV, p. 47. 17." Theological Dictionary," by Karl Rahner & Herbert Vorgrimler, 1965, (Herder and Herder, NY) p. 470. Section 3: Was It Clearly a Bible Teaching? 18. "The Illustrated Bible Dictionary", 1980, Part 3, (InterVarsity Press, Tyndale House Publishers, Hodder and Stoughton, Sydney and Auckland, Australia) p. 1597. 19. "New Catholic Encyclopedia", 1967, Vol. XIV, p. 304. 20. "The Catholic Encyclopedia," 1912, Vol. xv, p. 47. 21. "Trinitas: A Theological Encyclopedia of the Holy Trinity", by Michael O'Carroll, 1987, p. 208. 22. "The Encyclopedia of Religion," Mircea Eliade, editorinchief, 1987, Vol. 15, (Macmillan Publishing Company, NY) p. 54. 23. "New Catholic Encyclopedia," 1967, Vol. xiv, p. 306. 24." The Triune God", by Edmund J. Fortman, 1972, (Baker Book House, Grand Rapids, MI) pp. xv, 8, 9. 25." The Encyclopedia of Religion", Mircea Eliade, editorinchief, Vol. 15, p. 54. 26." The Triune God", pp. xv, xvi, 16. 27." The New Encyclopaedia Britannica," 1985, Vol. 11, Micropaedia, (Encyclopaedia Britannica, Inc., Chicago, IL) p. 928. 28. "A Short History of Christian Doctrine" by Bernhard Lohse, 1966, (Fortress Press, Philadelphia, PA) p. 38. 29. "The New International Dictionary of New Testament Theology," Colin Brown, general editor, 1976, Vol. 2, (Zondervan Publishing House, Grand Rapids, MI) p. 84. 30. "Origin and Evolution of Religion", by E. Washburn Hopkins, 1923, (Yale University Press, New Haven, CT) p. 336. 31. "The Paganism in Our Christianity", p. 197. 32." The New International Dictionary of New Testament Theology", Vol. 2, p. 84. 33." The Paganism in Our Christianity", p. 198. 34. "Encyclopaedia of Religion and Ethics", edited by James Hastings, 1922, Vol. XII, (Charles Scribners Sons, NY) p. 461. 35. "New Catholic Encyclopedia", 1967, Vol. XIV, p. 299. 36. "The Church of the First Three Centuries", Alvan Lamson, 1869 edition, p 56-57, published by the British and Foreign Unitarian Association, (Horace B. Fuller, Boston, MA). Section 4: How Did the Trinity Doctrine Develop? 43. "Babylon the Great Has Fallen! ", Watchtower Society, 1963, p. 477. 44. "The Early Church," by Henry Chadwick, 1967, (Penguin Books Ltd., Harmondsworth, Middlesex, England) pp. 122, 124. 45. "Encyclopaedia Britannica", 1971, Vol. 6, (Encyclopaedia Britannica, Inc., Chicago, IL) p. 386. 46. "A Short History of Christian Doctrine," by Bernhard Lohse, 1966, p. 51. 47." The New Encyclopaedia Britannica," 1985, Micropaedia, Vol. 11, p. 689. 48." The Encyclopedia Americana," 1977, Vol. 27, p. 117. 49." Catholicism", edited by George Brantl, 1962, pp. 69, 70. 50." The New Encyclopaedia Britannica," 1985, Micropaedia, Vol. 1, pp. 664, 665; "History of Dogma," by Adolph Harnack, Vol. 4, 1958 edition, (Russell and Russell, NY) p. 136. 51." Origin and Evolution of Religion," by E. Washburn Hopkins, 1923, p. 339. 52." The Encyclopedia Americana," 1956, p. 294L. 53." The Story of Civilization:" Part III, "Caesar and Christ," by Will Durant, 1944, (Simon and Schuster, NY) p. 595. 54. "Egyptian Religion", by Siegfried Morenz, 1973, (Cornell University Press, Ithaca, NY) p. 255. 56. "History of Christianity", by Edward Gibbon, 1891, (Peter Eckler, No. 35, NY) p. xvi. 57. "A Dictionary of Religious Knowledge," by Lyman Abbott, 1875, p. 944. 58." The Paganism in Our Christianity", p. 197. 59." Encyclopaedia of Religion and Ethics" edited by James Hastings, 1922, Vol. XIi, p. 458. 60." Nouveau Dictionnaire Universel," by Maurice Lachatre, Paris, (no date), Vol. 1, p. 1467, English translation in August 1, 1984 "Watchtower", p. 21. 61. "The New SchaffHerzog Encyclopedia of Religious Knowledge", edited by Samuel Macauley Jackson, 1957, Vol. IX, (Baker Book House, Grand Rapids, MI) p. 91. 62." The Church of the First Three Centuries", by Alvan Lamson, 1860 edition, p. 34. 63. "Outlines of the History of Dogma," by Adolf Harnack, 1957 edition, (Beacon Press, Beacon Hill, Boston, MA) p. 194. 65. "A Statement of Reasons", by Andrews Norton, 1872, Fifth edition, (American Unitarian Association, Boston, MA) pp. 94, 104. Section 5: What Does the Bible Say About God and Jesus? 66. "A Critical History of the Evolution of Trinitarianism", by Levi Leonard Paine, 1900, (Houghton, Mifflin, and Company, Boston and New York; The Riverside Press, Cambridge) p. 4. 68." A Dictionary of the Bible", by William Smith, revised and edited by F. N. and M. A. Peloubet, 1948, (MacDonald Publishing Company, McLean, VA) p. 220. 69. "The American Journal of Semitic Languages and Literatures", Vol. XXI, 1905, p. 208, taken from "Insight on the Scriptures", (Watchtower) Vol. 1, 1988, p. 968. 71." Webster's New Collegiate Dictionary," 150th Anniversary Edition, 1981, (The G. & C. Merriam Company, U.S.) p. 99. 72." Vine's Expositor Dictionary of Old and New Testament Words", by W. E. Vine, 1981, (Fleming H. Revell Co., Old Tappan, NJ) p. 140. 73. "The Exhaustive Concordance of the Bible", by James Strong, 1890, (Abingdon Press, NY) pp. 20, 49. 74. "A Greek and English Lexicon of the New Testament", by Edward Robinson, 1850, (Harner & Brothers, Publishers, NY) p. 471. 75." Theological Dictionary of the New Testament", edited by Gerhard Kittel, 1967, Vol. IV, (Wm. B. Eerdmans Publishing Company, Grand Rapids, MI) pp. 738, 740. 76." Bulletin of the John Rylands Library." Manchester, England, 196768, Vol. 50, (The John Rylands Library, Manchester, England) p. 258. 77. "Ibid". pp. 258, 259. 80. "Our Orthodox Christian Faith", by Athanasios S. Frangopoulos, Third Edition, 1985, (The Brotherhood of Theologians, Athens) p. 71. 81." The Triune God", p. 9. 82." Word Pictures in the New Testament", by Archibald Thomas Robertson, 1930, Vol. I, (Harper & Brothers Publishers, NY and London) p. 245. 83." The New American Bible", 1970, (Catholic Book Publishing Co., NY) p. 128. 84." The Catholic Encyclopedia", 1912, Vol. 15, (The Universal Knowledge Foundation, Inc., NY) p. 49. 85." The Triune God", pp. 6, 15. 86." New Catholic Encyclopedia", 1967, Vol. 14, (The Catholic University of America, Washington, D.C.) p. 574. 88. "A Catholic Dictionary", by William E. Addis & Thomas Arnold, 1960, p. 810, revised by T. B. Scannell, P. E. Hallett, Gordon Albion and members of staff of St. John's Seminary, Wonersh (Routledge & Kegan Paul Limited, London). Section 8a: What About Trinity "Proof Texts"? 90. "New Catholic Encyclopedia," 1967, Vol. XIV, p. 306. 91. "Cyclopedia of Biblical, Theological, and Ecclesiastical Literature", by John McClintock & James Strong, 1287, Vol. X, (Baker Book House, Grand Rapids, MI) p. 552. 94. "Commentary on the Gospel According to John," by John Calvin, translated from the Latin by William Pringle, 1847, Vol. 1, (The Calvin Translation Society, Edinburgh) p. 417. 95. "The Holy Bible," Douay Version 1609, (P. J. Kennedy & Sons, NY) p. 206. 96. "The Holy Bible", Authorised King James Version, 1611 (by Collins ClearType Press for Watch Tower Bible and Tract Society) p. 161. 97. "The New Testament", by George R. Noyes, 1869, (American Unitarian Association, Boston, MA) p. 432. 98. "Das Neue Testament in Der Scrache Von Heute" by Friedrich Pfaffllin, 1965, (Verlegt Bei Eugen Salzer in Heilbronn) p. 381. 99. "La Bibbia Concordata" edited by Arnoldo Mondadori, 1968, (Societa Biblica Italiana) p. 1938. 100. "Good News Bible, The Bible in Today's English Version," 1976, (American Bible Society, NY) p. 266. 101. "The New Jerusalem Bible", 1985, (Doubleday & Co., Inc., Garden City, NY) p. 1941. 102. "The Epistle of Paul to the Philippians", by Ralph P. Martin, 1959, (The Tyndale Press, London) p. 97. 103. "The Expositor's Greek Testament", The Epistle to the Philippians by H. A. A. Kennedy, 1967, (Grand Rapids Book Manufacturers, Inc., Grand Rapids, MI). 104. "The Holy Bible", Authorised King James Version, 1611, p. 50. 105." The Pentateuch and Haftorahs", edited by Dr. J. H. Hertz, 1941, Vol. 1, (Oxford University Press) p. 215. 106. "The New Testament," by George R. Noyes, 1869, p. 220. 107. "The Bible, An American Translation," by J. M. P. Smith & Edgar J. Goodspeed, 1935, (University of Chicago Press, Chicago, IL) p. 95. 108. "Das Neue Testament," by Jorg Zink, 1965, (KrenzVerlag Stuttgart, Berlin, Germany), p. 230. 109. "The Living Bible Paraphrased," 1971, (Tyndale House Publishers, Wheaton, IL) p. 847. 110. "The Simple English Bible, New Testament," American edition, 1981, (International Bible Publishing Company, NY, NY) p. 273. 111. "The Living Bible Paraphrased," 1971, p. 847. Section 8b: What About Trinity "Proof Texts"? 112. "The Holy Bible", Authorised King James Version, 1611, p. 75. 113. "Journal of Biblical Literature," edited by Joseph A. Fitzmyer, 1973, Vol. 92, (The Society of Biblical Literature) p. 85. 114. "The New Testament in an Improved Version, Upon the basis of Archbishop Newcome's New Translation: With A Corrected Text," 1808, (Richard Taylor and Co., London). 115. "The Emphatic Diaglott" by Benjamin Wilson, 1864, (Fowler & Wells Co., Publishers, NY). 116. "La Bible du Centenaire", L'Evangile selon Jean, by Maurice Goguel, 1928. 117. "The Bible, An American Translation," by J. M. P. Smith & Edgar J. Goodspeed, 1935, p. 85. 118. "Das Neue Testament", by Ludwig Thimme, 1946, p. 219. 119. "New World Translation of the Christian Greek Scriptures", 1950, p. 282. 120. " The New Testament", by James L. Tomanek, 1958, (Arrowhead Press, ID). 121. "Das Evangelium nach Johannes," by Siegfried Schulz, 1975, (Gottingen, Vandenhoeck & Ruprecht). 122. "Das Evanqelium nach Johannes", by Johannes Schneider, 1978. 123. "Journal of Biblical Literature", edited by Joselph A. Fitzmyer, 1973, Vol. 92, p. 85. 125. Joseph Henry Thayer's personal copy of Griesbach's Greek New Testament text, 1809, with Thayer's handwritten comments on John 1:1 interleaved. 126. "Dictionary of the Bible", by John L. McKenzie, 1965, (Macmillan Publishing Co., Inc., NY) p. 317. 127. "Theology Today", (magazine) April 1953, p. 75. 129. "Bulletin of the John Rylands Library," Manchester, 1967-68, Vol. 50, p. 253. 131. "The Amplified Bible, 1965, (Zondervan Bible Publishers, Grand Rapids, MI) p. 325. 132. "New Catholic Encyclopedia, 1967, Vol. X, p. 21. 133. " Ibid., Vol. IX, p. 359. 134. "Christianity and the World Religions, by Hans Kung, 1986, (Doubleday & Co., Inc., Garden City, NY) p. 113. 135." Time, (magazine; Time Inc., NY, NY) December 16, 1946, p. 64.